CITC FOGMAX with 1 ch. DMX on board and 5 pin remote cycle-timer w/ variable output for longer periods. 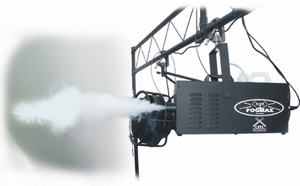 Absolutely the best bet for professional fog, the FogMax was chosen for movies such as "Ladder 49," where dynamic, dependable fog machines were high on the priority list. No other comparable machine delivers a thicker, whiter output of 30,000 cfm (.85 cu.m per minute) of digitally controlled fog. CITC's FogMax boasts a non-clogging head and can produce longer on high than the stiffest competition. Accurate temp. control makes shutdown history. It has a quieter pump with a 1500 watt heating head, a 1 channel DMX on board, remote control cycle timer and hanging bracket. You'll never need to change the heating head. Safety considered first, the FogMax has three safety checks, including a circuit breaker reset button. The extra thick, rust resistant cover is made to be show tuff! Best bet for professional fog. Uses water-based CITC SmartFog fluid. Manufactured in the USA by CITC.